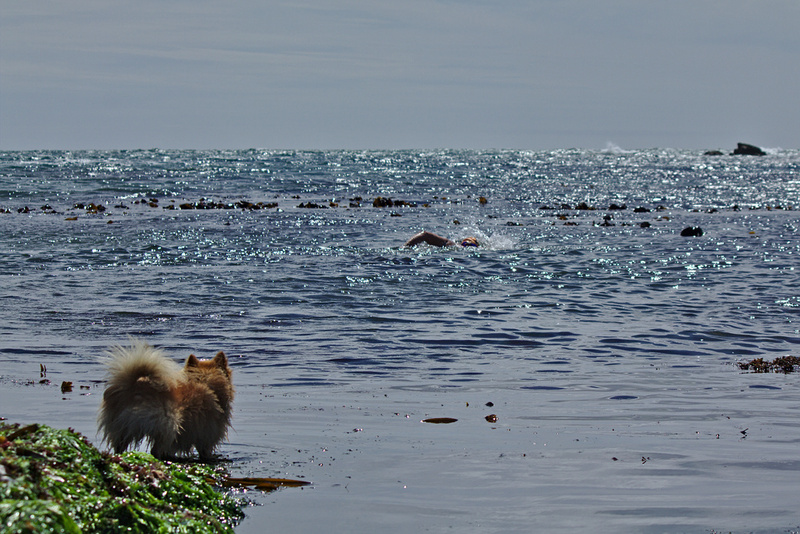 The Doglet is never pleased to see me swimming off…or toward, or beside him, or at all. Due to the goggle change the stop at Gararrus took about two minutes before I set off, the Doglet once again having a barking fit as I left (his normal reaction to me swimming). 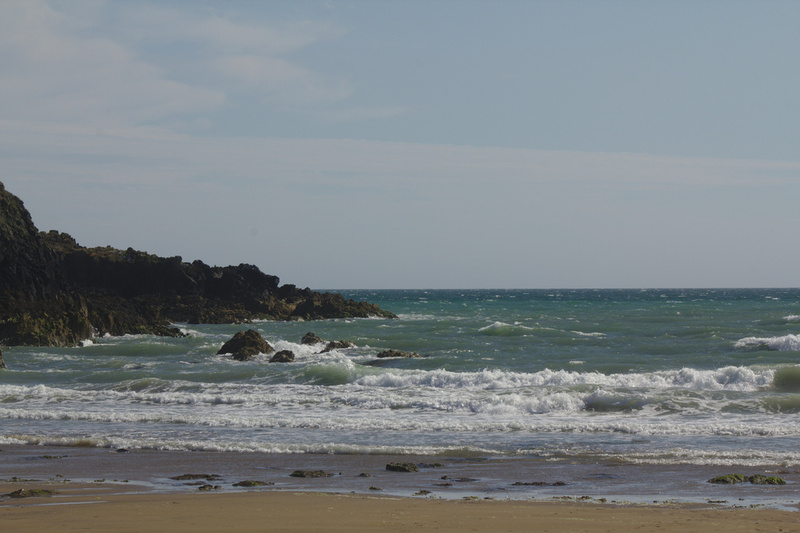 It was low tide by now so all the reefs off Gararrus were exposed and I had to swim out the long 200 metre channel again before turning west across Gararrus Bay, heading for the gap between Sheep and Rat islands, a gap which was also impassable due mainly to the low tide. The current was pushing around Rat Island slowing me further as I tried to round it into the wide expanse of the greater Kilfarassey area. I didn’t pass Rat Island until two hours has passed with only about five kilometres swum. From there I had to swim the length of the the stretch I call “the toughest kilometre on the Copper Coast“. Though usually this stretch has the adverse current flowing west, now that I was swimming that direction, the conditions continued to conspire against me and the potentially assisting current was absent. Around the Kilfarassey reefs before entering the sheltered area inside the protective outside reefs, and crossing into the beach inside to pick up my next feed from Dee who once again awaited with the Doglet. I set off again, having shouted to Dee that it was the conditions that were slowing me so much. Once again I aimed west and into the shelter of the western Kilfarassey promontory, hoping to swim through The Cave of Screaming Terror, but this was also washed out. 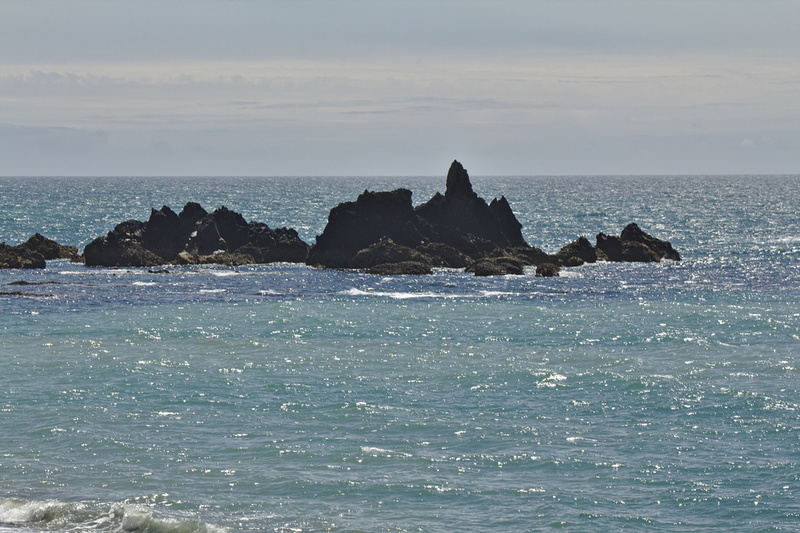 So I had to swim around yet another promontory, which like all the previous ones was concentrating the wind-driven chop into a head current, this one the worst and slowest of the day. Progress was very slow. It took me 25 minutes to cross the 800 metres to the promontory and another five minutes to swim less than a hundred metres. All the while the Sun blazed in a blue sky, the sea shifted and heaved and sparkled and I got bounced around. The stretch from Kilfarassey to Annestown is a 1.8 kilometre long beach, only accessible at low tide, and backed by a line of straight high cliffs, like Ronan’s Bay another remote section. By now my shoulder were starting to feel heavy as I’d left the fresh feeling of the first couple of hours behind. This heaviness always arrives and isn’t indicative of much once you are familiar with it. For a new swimmer it brings the worry of not being able to complete but for the salty dogs, it’s merely the next real part of the swim. Heavy shoulders? So what. As I left the promontory a hundred metres behind, I caught of glimpse of movement in the sky from my left seaward eye. On my next breath I saw Rescue 117 above and behind me, but in close and dropping. My stomach sank. There was very little chance of anyone on the cliffs who could have seen me, and I’d been close to Kilfarassey beach only 30 minutes ago, and there was no way Dee had called them. They took a quick look at me while I swam on (fearing if I stopped they be sure to try to rescue me) but quickly they flew away south-west out past Annestown. The onshore continued to zig me in to the long beach while I constantly tried to zag out further. The surf and waves were biggest here, unsurprisingly as this beach has the best reef break for local experienced surfers. This long straight beach has the irregular reefs so common on this coast from heavy erosion and at least three times on this stretch I dodged barely sub-surface rocks that appeared at the last second while duck-diving looming breakers and trying not to get cracked like a walnut on the reefs. Unexpectedly this stretch proved to be most similar to Evan’s description of the Pacific Beach breakers and rocks. I finally passed Annestown Reef, the surfer’s break, and inside the protection of Brown’s Island which stretches out from the beach, and is an island only above mid tide. The water calmed completely in the couple of hundred metres east of the island but, just for the final kick, I was once again unable to pass through the tunnel through the island and had to swim around the outside again on my way to the beach. I’d swum just over ten kilometres which due to tide and conditions had taken an astonishingly long three hours fifty nine minutes and twenty seconds. An average speed of two and half kilometres per hour! Rough water on the beach at the finish. I would liked to have continued to Boatstrand but my poor partner had been tortured enough wondering why I was taking so long and if I was safe. She also told me that the Rescue 117 flyby had been because they had been out on a rescue just off Annestown about half a mile from where they’d passed me. 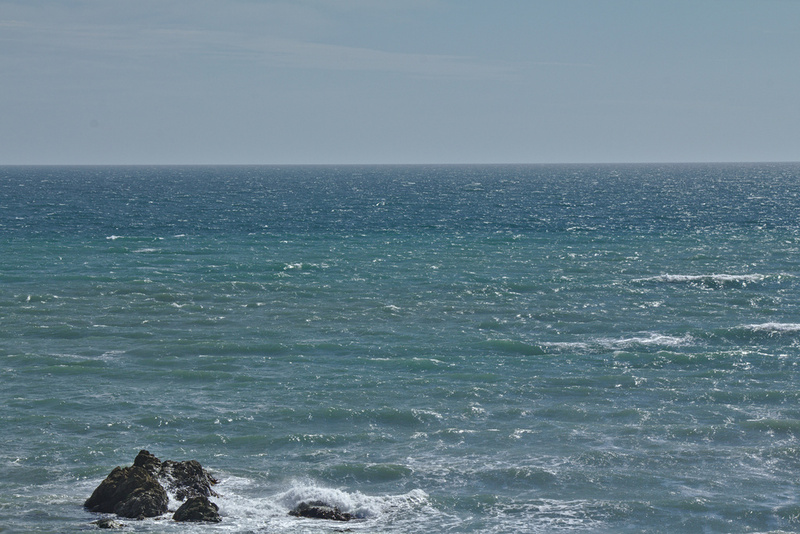 It was a difficult, rough, long, exposed, slow and even moderately dangerous swim with too much wind on the wrong tide. I loved it and it elevated my mood significantly for a while. It included some things I love most about swimming: Swimming by myself, swimming where I can’t be seen by anyone, swimming in unfavourable conditions. I was slightly dehydrated as afterwards we drove back to Tramore where I picked up parking bollards to use for the Copper Coast Distance Camp swim which took place the next evening on a much better day. 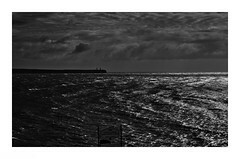 And then we went for fish n’ chips from Tramore’s well-known Dooley’s chipper, which we ate from the bag while sitting on the prom looking out onto our coast. Never were fish n’ chips so good, never was a day so good. Looking back at the end of an unusually good summer which went right off the rails in early autumn, with winter ahead, when I think of all the swims I’ve done, this swim ranks in my top five favourite swims ever. Thanks to Evan for the inspiration. Thanks to Dee for enabling the stupidity and thanks even to the Doglet for the inordinate amount of hilarious barking every time I swam toward or away from him. Thanks to Rescue 117 for dropping by. 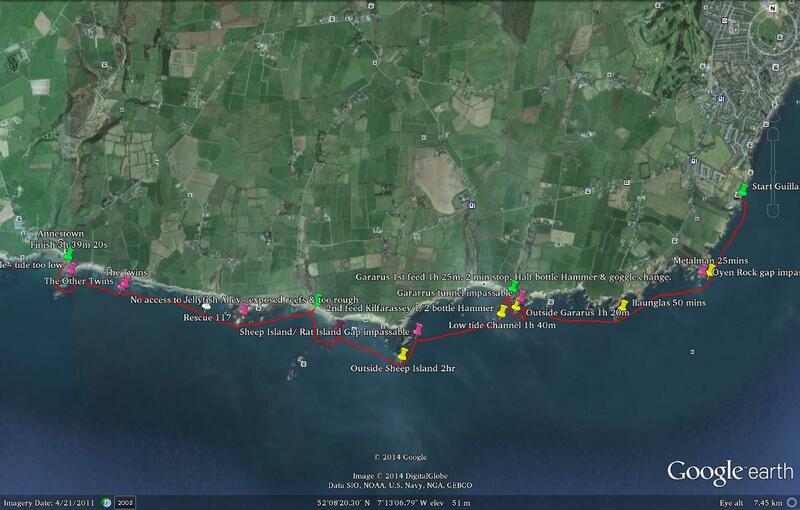 This was a test swim for running an organised MSF Copper Coast Bay to Breakers in 2015 in mid to late July (date to be fixed). The swim will have a wider range of acceptable conditions than most swims. After all, it’s not like I’ll feel sorry for any entrants whining about rough water or the wrong tides! Start will be at Tramore Pier for a total distance of over 11k. Forum Members will get a reduction in entry fee. Forum membership is entirely free of course. You’ll just have to come over for it. I’ll give you and Cathy free entry and I’ll try to run it on a bad tide. Love this, Donal. It’s great that you both dare swim and take the time to bring us places many of us can only dream of. How amazing to see the familiar through such different goggles. Next year, maybe we’ll have a look at a few of these together! Ah, just what I wanted to hear! Thanks so much. Excellent post Donal and what an Amazing Swim. Thanks to Dee also for making it possible! I was on the edge of the seat here reading this. I dunno Sam, I guess I’m pretty used to the Copper Coast by now. Maybe you’ll get in training for a longer swim with me next year…? Hi Donal – Just sent an email re the footage of swimming through Uaimh an tSolais & Uaimh na nÉan. What I didn’t mention was that the CCB2B post/swim left me thinking 25 meter pools and interval training! On the way down for membership now so I’ll hold you to the longer swim!